This is a short video of my Shiva Paintstik painting coming to life in a stop action video. I decided to take a picture roughly every 10 minutes as I created the painting, "Over the Top". I hope you enjoy watching how I approach the full scale Paintstik works. This is another of my full scale Shiva Paintstik paintings. 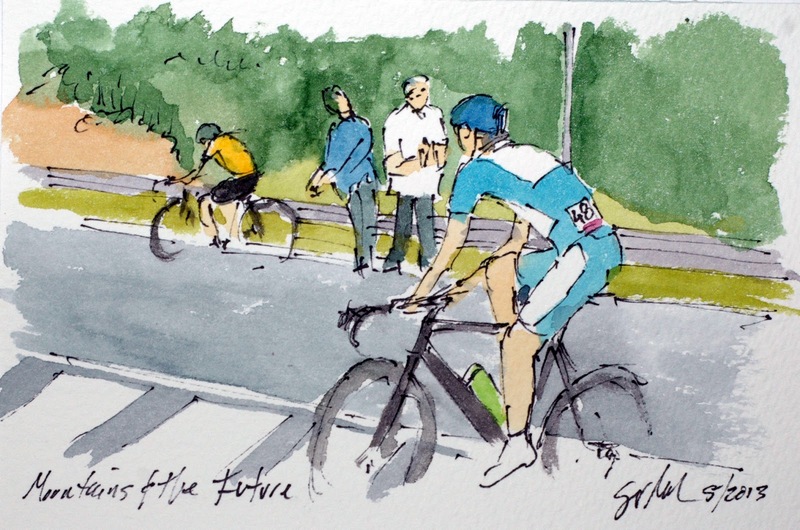 This particular one is from a local cycling event in Richmond, Virginia where I live. The ride is the Cap2Cap, and is a century from Richmond down along the James River towards Williamsburg and back, thus the name, Capitol to Capitol. The ride meanders along quite one lane country roads in mid May, past plantations and cotton fields with a turn around at a wonderful park near the Jamestown settlement. Shiva Paintstiks available at www.richesonart.com are a drawing form of oil paint but without the need for brushes, solvents or a palette, all of the mixing happens right on the surface of the painting. The title of the painting, "Are We There Yet" is my feelings around 80 miles into the 100 miles of a century. You can find purchase and size information at my artist website, www.greigleach.com or just follow the direct link at the end of this post. Quoting Phil Leggit again, "Done and dusted" is his description for something behind all finished. 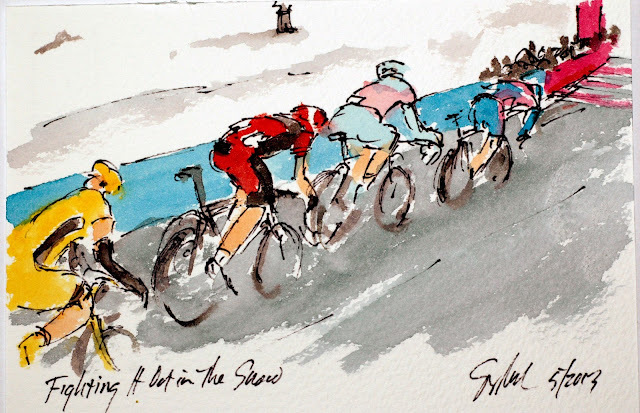 While I have not worked as hard, suffered as much or been as cold as the valiant warriors of the two wheels, I am thrilled to have taken on the Giro and happy to have painted the final painting of the final stage. Mark Cavendish remained calm and focused as Cannondale swamped him and his lead out man. 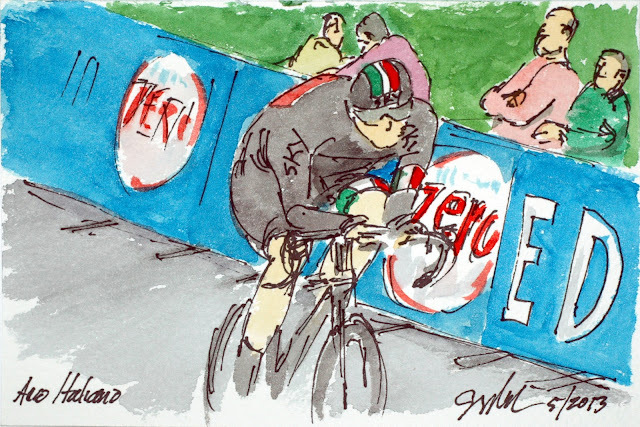 He just tucked in behind waited for his moment and then showed why he now has five victories in the 2013 Giro d'Italia. This is an original watercolor and ink postcard and is available for purchase in a 3 day auction on ebay. Just follow the direct link at the end of this post, but hurry, the auction begins as soon as this post is published. This is the last for the Giro. I planned to paint one race between now and the Tour de France. I haven't decided on which race, although I am leaning towards the Criterium Dauphine, I would welcome any suggestions. Please leave a comment if you have an idea which June race would be best. 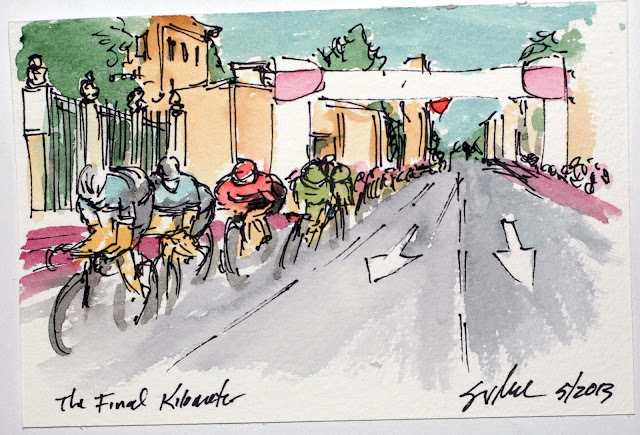 The final kilometer of the stage and in this case the Giro d'Italia is marked by a red triangle or kite from a banner that hangs above the riders' heads. Mark Cavendish is the third man in line behind his two remaining members of his lead out train. Cannondale his still fighting to get their line together for their man, Elia Viviani. This is an original watercolor and ink postcard that can be yours by visiting my artist website. Just follow the direct link at the end of this post. Giro Final Day: Everybody Still There? With Omega Pharma Quickstep driving the whole peloton through the streets of Brescia the guys on the front want to make sure the train is in order and Mark Cavendish is still on board. Cannondale has lined up behind them, taking the ride and waiting to launch their sprinter. This is an original watercolor and ink postcard and can be yours by going to my artist website and adding it to your shopping cart. Why not look at all of the art at the site? Just follow the direct link at the end of this post. After 200 kilometers of chatting, celebrating and saying farewell the peloton arrived in Brescia. 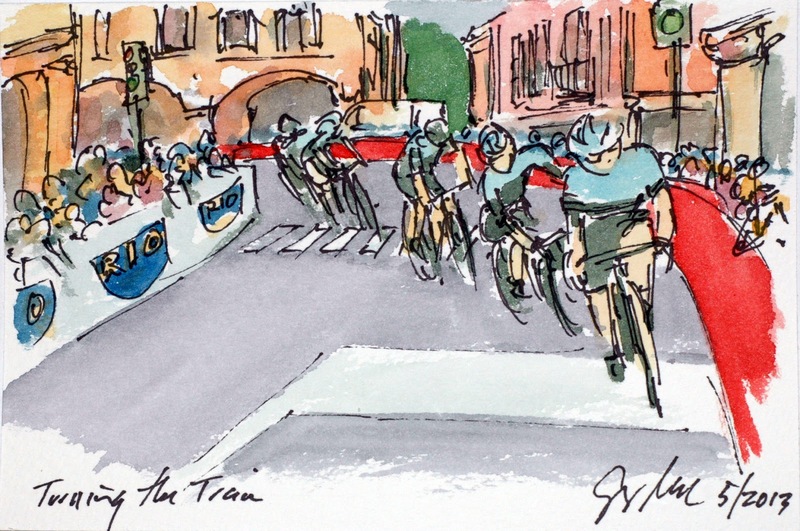 With a single victory lap for Team Astana and Vincenzo Nibali it was time to race. Omega Pharma Quickstep came to the front ramped up the speed and set about the task of delivering Mark Cavendish to the line. This is an original watercolor and ink postcard that can be yours by going to my artist website. Just follow the direct link at the end of this post. While watching the Italian TV broadcast, I thought this was the first attack on the finishing circuits, I need to improve on my Italian. This Stefano Garzelli taking a farewell bow to the tifosi who have come to see the end of the 2013 Giro d'Italia. I was trying to figure out why he or the peloton were not down in the drops (on the handlebars) but were riding rather relaxed. After about a kilometer, he dropped back into the peloton and everyone got to the task at hand. 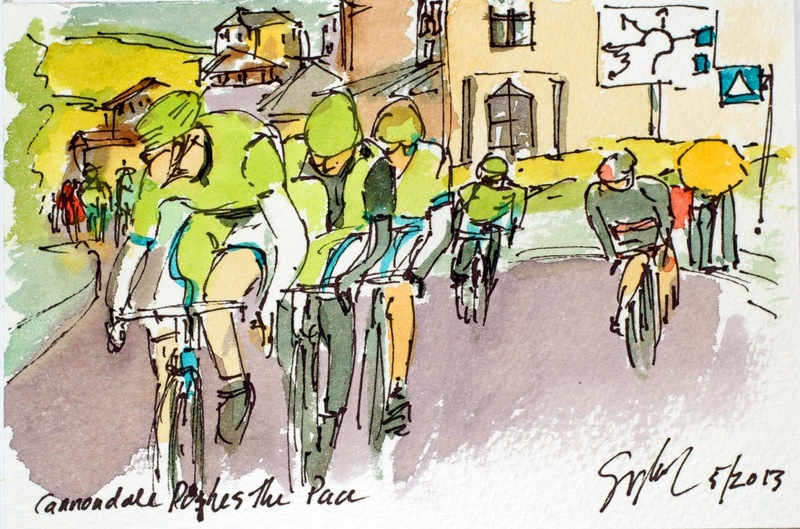 The title is a nod to Phil Legget a long time cycling commentator, who would refer to an attack as a "pedal turned in anger." This is an original watercolor and ink postcard that can be yours by visiting my artist website. Just follow the direct link at the end of this post. I admit it, I am taken with the beauty of Italy. So many of the traffic circles and islands are gloriously planted and festooned with public art. 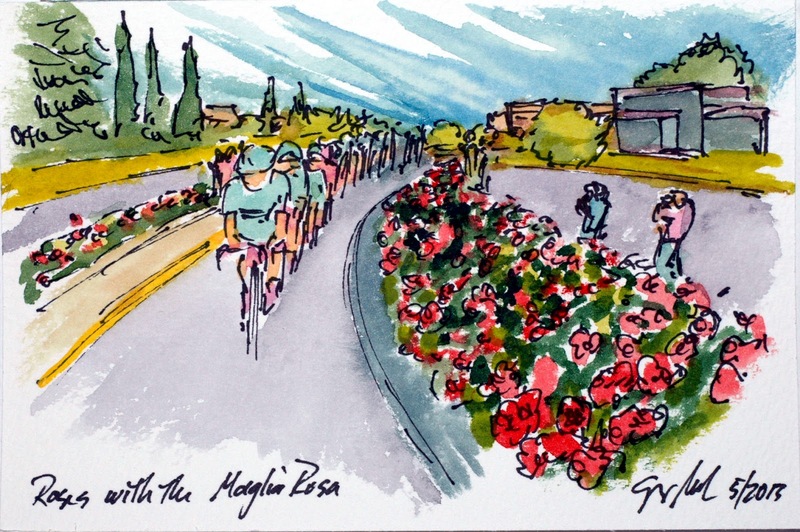 Here the Astana driven peloton swings into Brescia slipping through these islands of roses. The last of the day's traditions is to let the team with the leader's jersey to enter the town and take the first lap of the finishing circuit as a victory lap. This is an original watercolor and ink postcard that can be yours through my artist website. Just follow the direct link at the end of this post. Another mechanic hanging out the back seat window working on a moving bike. He is reaching so far he has almost reached right out of his pants. The problem was the cadence reader was slipping on the chain stay, bear in mind that the spokes are zipping along at 25 mph (I have no idea what the RPM would be) and one slip and the best he can hope for is really sore fingers. Let alone what can happen if the bike goes down. This is an original watercolor and ink postcard and it can be yours by visiting my artist website. Just follow the direct link at the end of this post. 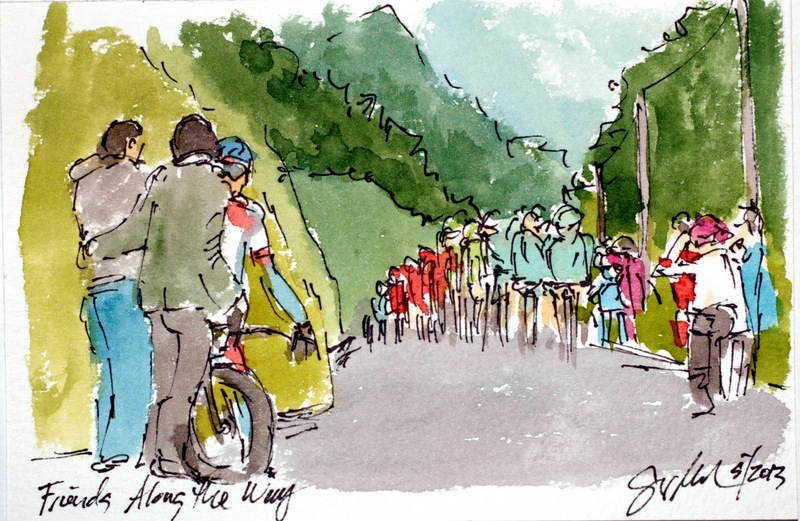 Yet another final day tradition, while the peloton is meandering along, the leader's jersey will visit each of the team cars shaking hands and receiving their congratulations. 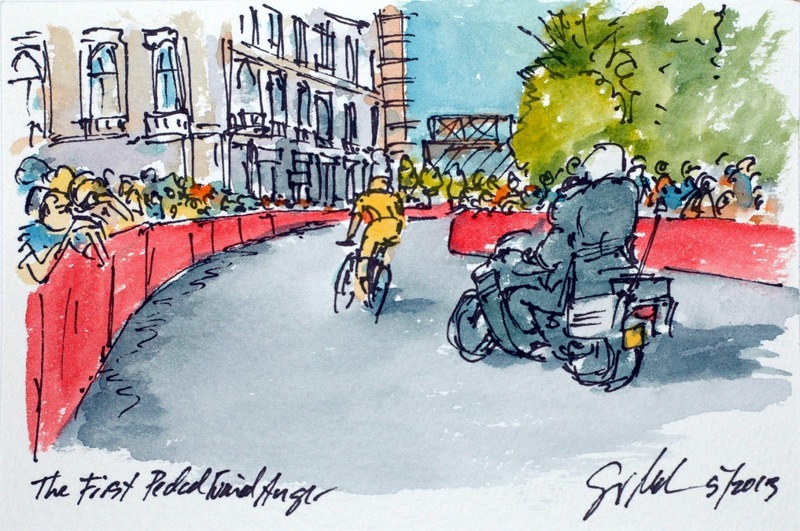 The final stage is not about racing until after the first lap of the finishing circuit. 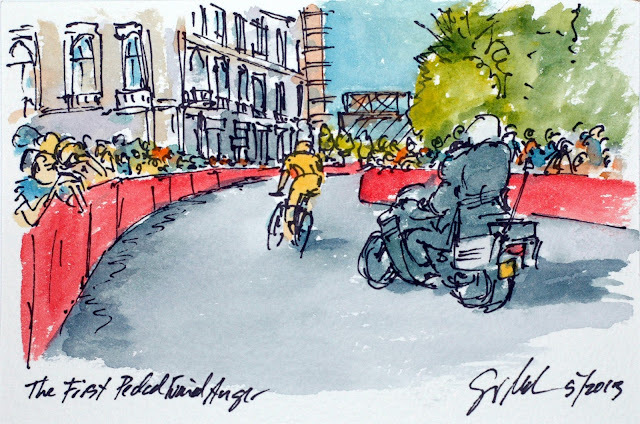 Then look out, every sprinter only has one last chance to win a stage, and in the case of the Tour de France it is always on the most famous avenue in Paris. The Giro changes its finishing city like it changes it finishing towns with every stage, but that makes the victory no less important. This is an original watercolor and ink postcard that can be yours by visiting my artist website. Just follow the direct link at the end of this post. Another last day tradition is reserved for the team that has the winning jersey, the champagne. 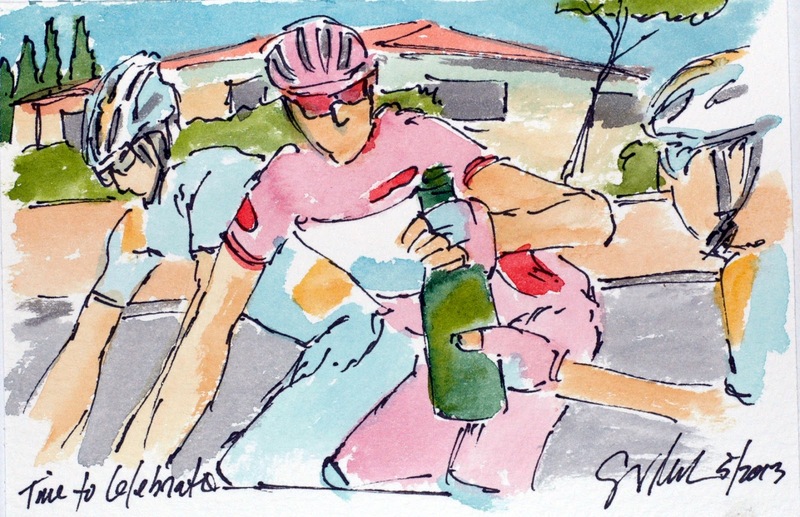 Sometimes it is poured in the team car and glasses are passed around inside the car and to the entre team, Astana went a little less formal and drank from the bottle. The team worked its heart out for Nibali, while he wears the Maglia Rosa, it is a team victory. This is an original watercolor and ink postcard and it is available for sale at my artist website. Just follow the direct link at the end of this post, but hurry, you know everyone will want this image. Well every Italian, Nibali and/or Nibali fan at least. 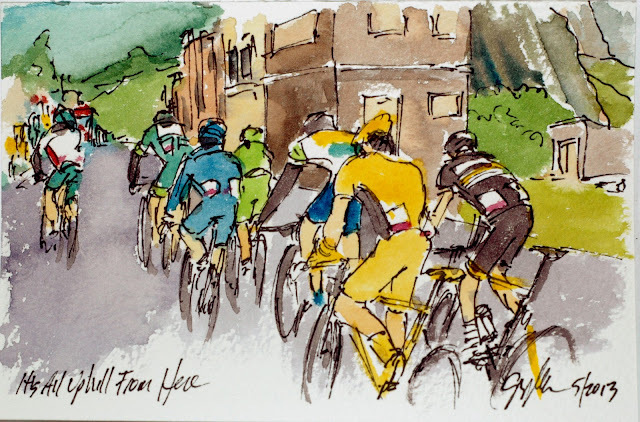 Another of the traditions of the Grand Tours is the final stage, most always flat, they are a chance to celebrate the various victories, chat with friends and former teammates, and generally cruise along having a good time. While the riders are taking it easy for pro-peloton standards, they are well out of my range of ability. Today Team Bardini loaded up with pizzas and passed them out to every team car, they were celebrating winning the Blue Jersey of best climber. This is an original watercolor and ink postcard and like every single other piece in this series, it was created using cake watercolors, brushes and paper from www.richesonart.com. And every piece is available for purchase on my artist web site. Just follow the direct link at the bottom of this post. I paint in awe of Vincenzo Nibali! 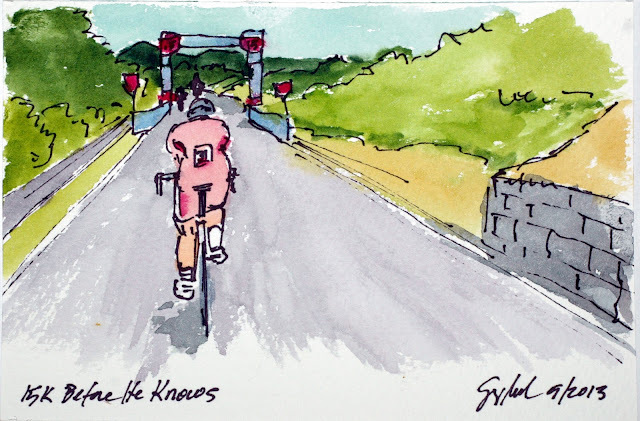 He has over four minutes on his nearest competitors and is climbing the last mountain of the 2013 Giro d'Italia, he is cold snow covered and is in is 12th day of wearing pink, and yet he collects all of the break aways up the road, and then goes clear to solo to victory in the Maglia Rosa. Understand he had no real reason to attack, but then a competitor always competes. I am sure he didn't make a lot of friends within the peleton, but he earned everyone's respect. He had sealed his victory with his time trial, today, he cast it in stone. This is an original watercolor and ink postcard and is available through my artist website. 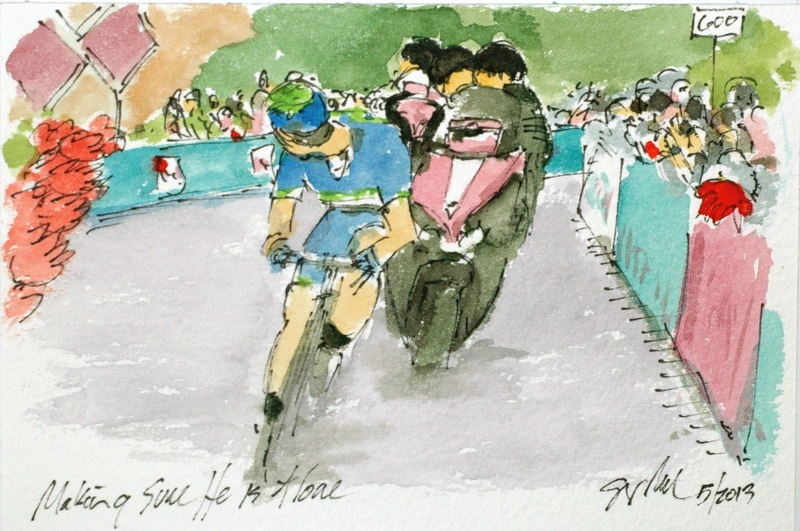 Just follow the direct link at the end of this post, but hurry, you know everyone wants this image of the 2013 Giro! Often times the phrase "plowing the way" is a figurative reference to the act of plowing snow out of the following groups way. Today, it was as close to literal as I have ever seen in a Grand Tour. These three, Cappecchi, Brambelli and Weening, have ridden away from the Maglia Rosa group hoping to win the stage while the contenders are willing to protect their positions and only race against each other. Alas, for these attackers, they didn't count on Nibali wanting to stamp his authority on the race with back to back stage wins. This is an original watercolor and ink postcard that can be yours by going to my artist website and adding this an many others to your shopping cart. Just follow the direct link at the end of this post. As I have discussed in early posts, there are many competitions within the overall race. The other leader award is the Maglia Blanco, worn by the highest placed young rider (under the age of 24). This Giro has seen a very tough competition between Mafka (who started the day in white) and Betancur, who is 3 seconds behind. 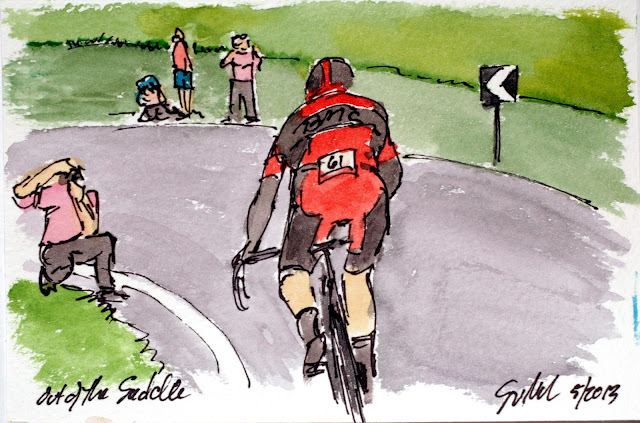 Near the bottom of the climb he either had a "nature break" or a mechanical, three of his teammates waited to pace him back into the race. By the time he was in sight of the Gruppo Maglia Rosa, they were gone and he had to close the gap by himself. He went on to honor the team's sacrifice by taking the White Jersey back, ensuring that he will end the Giro in white. This is an original watercolor and ink postcard and is available for sale at my artist website. Just follow the direct link at the end of this post. Every team had the same objective today, to move their man up in the standings and Team Cannondale was no different. Once the peleton reached the meat of the climb they came to the front to push the pace for Caruso. Team Astana finally caught a break, letting the other teams do the pace making, all they had to do is watch Evans and Uran, but even then, they could give up four minutes and Nibali would still be wearing pink. This is an original watercolor and ink postcard and it can be yours by following the direct link at the end of this page and purchasing this work at my artist website. 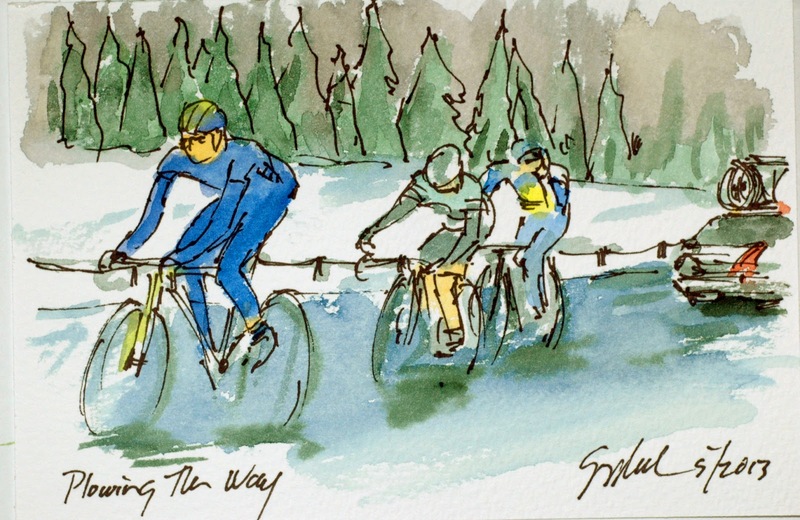 The peleton has gotten up into the snow line of today's climb and I am not the only one who thought this was a great image. The Giro is extensively covered by the world press, sporting and otherwise, not only are there five TV Moto, but there is a calavary of photographers riding on motorcycles getting thousands of still photos for magazines, newspapers and direct distribution. I can't tell you who this is, but I do agree with his taste in imagery. This is an original watercolor and ink postcard that can be yours by following the link at the end of this post to my artist website. The domestique has to help in any way he can. Stefano Pirazzi has decided he needs a heavier jacket for the coming snow covered climb, so his Bardiani teammate is actually holding the heavier jacket in his teeth waiting for Pirazzi to remove the lighter jacket. 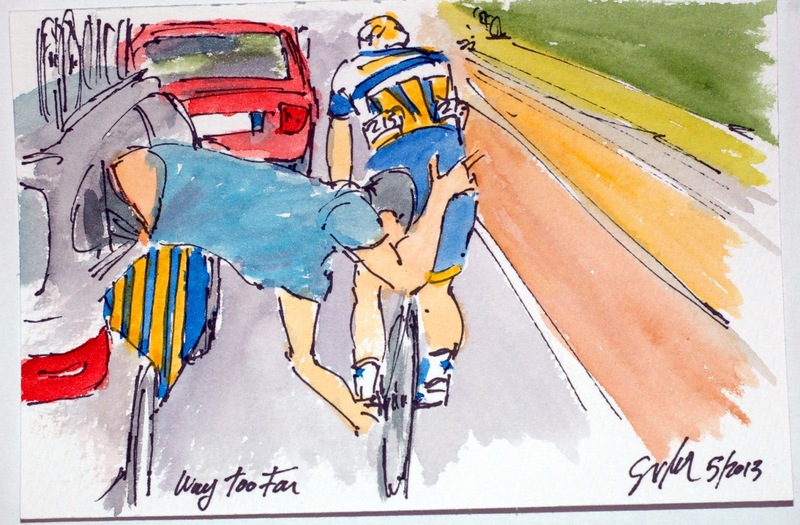 His teammate then passes the new one over, takes the lighter one and drops back to the team car. In case you are thinking that is job done, he then pedals back up through the peleton, to be beside his team leader should another need arise. All of this is in making sure that Pirazzi keeps the blue jersey of best climber in the 2013 Giro d'Italia. This is an original watercolor and ink postcard that can be yours by visiting my artist web site. Just follow the direct link at the end of this post. The pressure at the front by Euskatel stretched out the peleton into one long snaking line of cyclist who have been slowly climbing up through the river valley towards a snow covered finish of the day. As the TV broadcast passed through each town, the names were given in Italian and German (we are by the Austrian border. This is an original watercolor and ink postcard that can be yours through my artist website. Just follow the direct link at the end of this post. 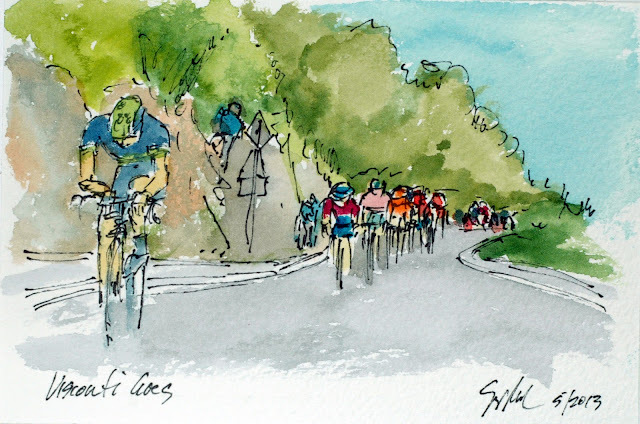 Team Euskatel came to the front of the peleton during the stage, driving the pace for their GC man Samuel Sanchez. Sanchez is riding high in the overall with a chance to move up in the standings thanks to a brilliant mountain time trial. 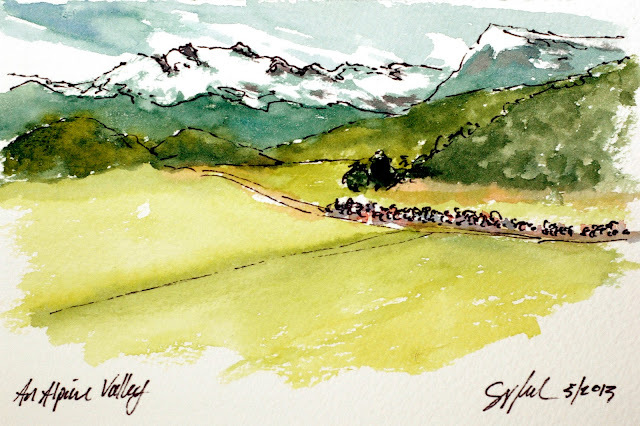 The peleton is riding through a beautiful river valley in the Dolomites of extreme northern Italy on their way to the final mountain top finish of the 2013 Giro. They are hopefully seeing snow for the last time this racing season. This is an original watercolor and ink postcard that can be yours by visiting my artist website. Just follow the direct link at the end of this post. 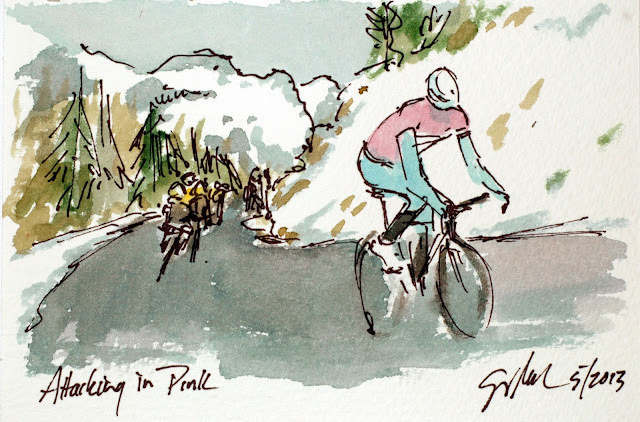 It is the final mountain stage of the 2013 Giro d'Italia and snow is playing a role again today. The snow is falling on the mountain tops forcing RCS Sports, the race organizers, to change the route again today. 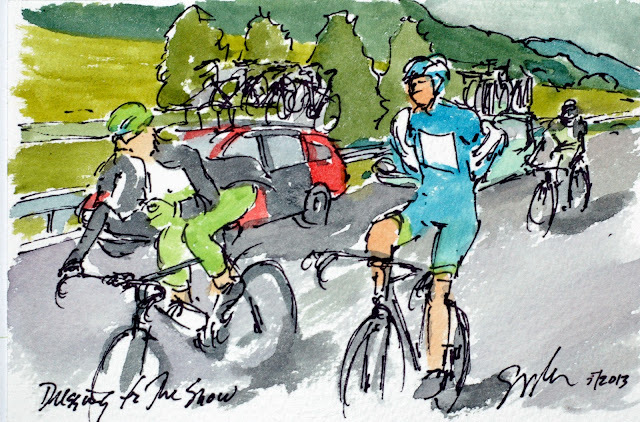 For the riders safety, two climbs were removed, more for the danger of descending in snow and icy conditions, but they left the final climb to the finish where it continues to snow heavily upon the waiting tifosis heads. Somehow it doesn't seem to be dampening the party along the route. Along with the neutral service cars, there are several motorcycles that carry spare wheels and water bottles for all of the riders, regardless of team. This is an early stage winner, Adam Hansen having a drink with his fellow break away riders, Yaroslav Popovich, Ermeti and Brutt. They all hope to spoil the plans of the contenders on the final climb of the Giro. This is an original watercolor and ink postcard and like all of the other works in this series, it has been created using cake watercolors, brushes and paper from www.richesonart.com. I highly recommend all of their art making products. This painting can be yours by visiting my artist website. Just follow the direct link at the end of this post. Hopefully, the clean peleton will be back to racing tomorrow. Michele Scarponi was laying down a blistering pace with the fastest time at the time check. It looked like he was in position to win the stage and overtake Uran for third overall. This group of cycling kit clad tifosi were equally excited to cheer one of the Italians favorites in the professional peleton. In the end Uran ride was enough to keep third by just over a minute and Nibali's ride both one the stage and secured a four minute lead in race for the Maglia Rosa. This is an original watercolor and ink watercolor that is available for purchase through my artist website, just follow the direct link at the end of this post. A time trial is a race that the cyclist does alone against the clock, but in a Grand Tour, a rider is rarely alone. All along the course, screaming fans yell "Vie! Vie!" encouraging you to go as fast! fast! as you can. Rigoberto Uran put in a great ride today, not enough to overtake Cadel Evans on GC but he was sixth on the day and moved to within 14 seconds of Cadel. While Nibali seems to have the Maglia Rosa in hand, the next two days will be hard fought for the podium positions. Just 4 minutes separate second through sixth places, the same amout of time that Nibali is in front of Evans in second place. This is an original watercolor and ink postcard that can be yours by visiting my artist website. Just follow the direct link at the end of this post, why not look around while you are there. 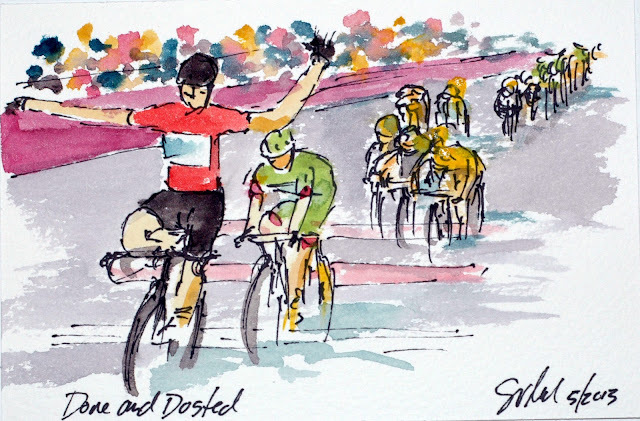 Vincenzo Nibali started from the velodrome at the bottom of the mountain resplendent in pink. 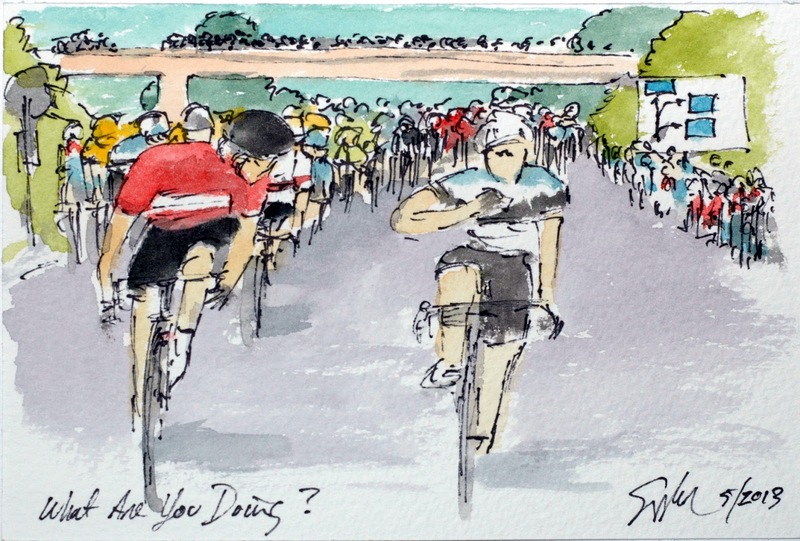 The last cyclist on the course has the added advantage of knowing all of the time checks of his competitors, so he knows how to dose his efforts. However, there is no knowing if the effort was enough until you cross the finishing line. Nibali put in the ride of his life to gain time on all of his rivals, winning the stage by 58 seconds over Samuel Sanchez. It is hard to imagine that today's effort not only won him the stage, but also ensured the overall Maglia Rosa as well. This is an original watercolor and ink postcard and is available for purchase through my artist website. Just follow the direct link at the end of this post to make this painting yours. Cadel Evans set out with high hopes for the stage today. Every time the camera cut to him, he was out of the saddle driving his cadence and climbing as fast as he could. Unfortunately, looks can be deceiving, while I thought he was making great gains, he actually lost two minutes to Vincenzo Nibali. He did manage to keep his second place on GC but Rigoberto Uran is now only 14 seconds behind him in third. While it looks like the race is in hand for Nibali, there will be some hard racing for podium positions on the next two mountain stages. This is an original watercolor and ink postcard and is available for purchase at my artist website. Just follow the direct link at the end of this post. Dario Cataldo was one of the few riders that went for full time trialing attire. Most went with road bikes with aerobars in an effort to keep the weight down since this was more about weight to power ratio than a pure power and aerodynamics of a typical time trial. Cataldo, riding for Team Sky, is the Italian National Time Trial Champion, so his racing kit includes the markings of the Italian flag. He had a great ride today, good enough to take first place until even stronger riders stormed up the mountain. This is an original watercolor and ink postcard that can be yours by visiting a brief 3 day auction on ebay and placing the winning bid. Just follow the direct link at the end of this post, but act quickly, the auction begins as soon as this post is published. Stefano Pirazzi, bedecked all in the blue of the leader in the Mountain Jersey, found he had a future racer trying desperately to stay even with the climber along today's stage. The kid was probably 12 or 13 and obviously wants to compete with the big boys. I wish I knew his name, I would love to see if this fantasy becomes a reality. He did get himself and the bike about 8 kilometers up the mountain side. This is an original watercolor and ink postcard that can be yours by visiting my artist website. Just follow the direct link at the end of this post to purchase your piece of the Giro d'Italia. 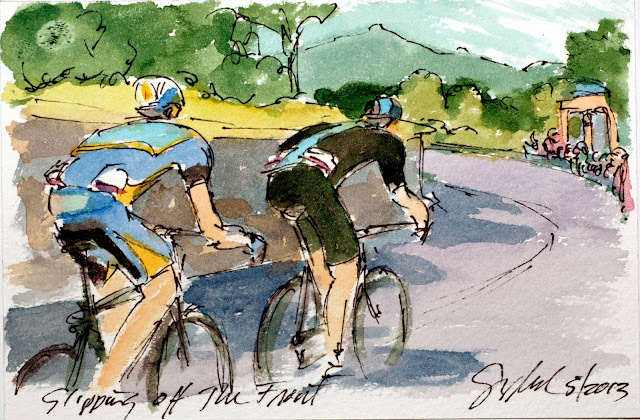 I don't recall ever seeing three guys come into the end of a time trial together. Eros Capeechi riding for Moviestar caught two of his minute men, while one of them had also caught the other, bringing them all in together. I didn't catch the names of either the Saxo Tinkoff rider on the member of Team Cannondale. Capeechi's ride was enough to move him into first place for a little while, but there were faster guys to come. This is an original watercolor and ink postcard and like all of the work in this series, it was created using cake watercolors, brushes and paper from www.richesonart.com. They are a great family run business that make truly excellent art supplies. This work is available for purchase at my artist website. Just follow the direct link at the end of this post. Visconti made a bold move jumping out of the peleton on the final climb (and only climb) of the day, quickly passéd the three other riders up the road and dove into Vincenza for a solo win. Like all experienced racers he check behind at the 600 meter sign to make sure he was still alone. 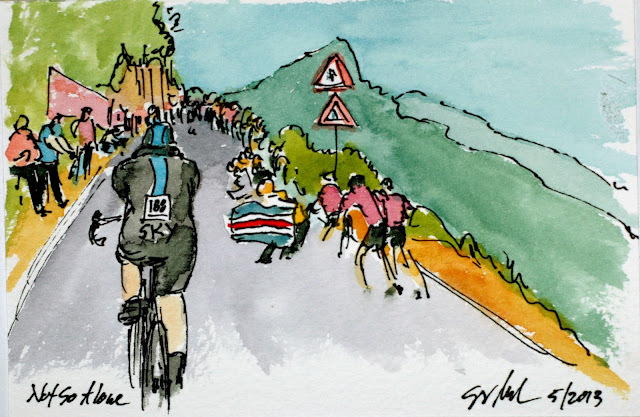 The Maglia Rosa group was coming hard, Cadel and Scarponi kept jumping to get away from Nibali, but he covered every move. The attacks kept their speed seesawing and helped to ensure Visconti's move succeed. 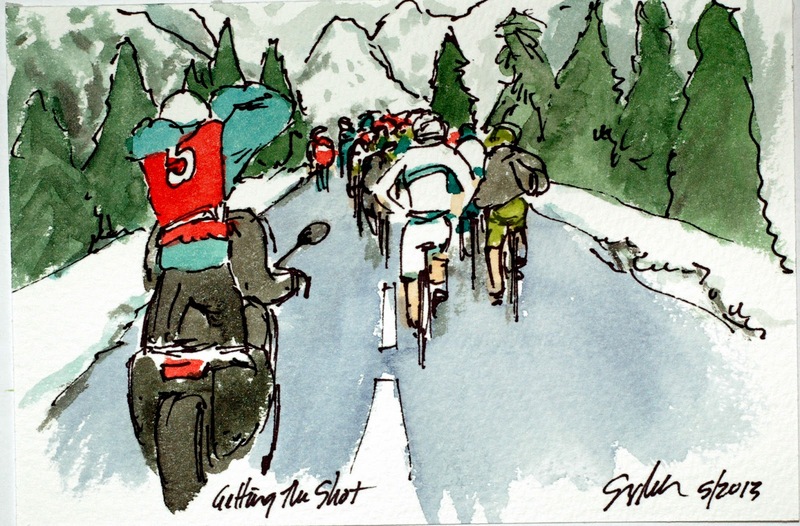 For the record this is his second stage win, with the first coming in heavy snow on the top of Galibier, today was a totally different victory but sweet just the same. This is an original watercolor and ink postcard that can be yours through a short 3 day auction on ebay. Just follow the direct link at the end of this post, but hurry the auction begins as soon as this post is published. Only one climb in Stage 17 but it was enough for Giovanni Visconti to jump away from the peleton in search of Di Luca, Rubiano and Durbridge. He quickly found each of them and slipped right on by. I don't know if his intention was a solo break for the line, but when he noticed he was alone at the crest, he certainly went hard for the finish. He managed to get away from no less than Scarponi, Nibali, Sanchez and Evans. This is an original watercolor and ink postcard that is available for purchase in a 3 day auction on ebay. Just follow the direct link at the end of this post, but hurry the auction begins as soon as this post is published. My daughter-in-law was watching me working on today's painting, and when she saw this view she exclaimed, "Why doesn't our country look like this, we go things!" 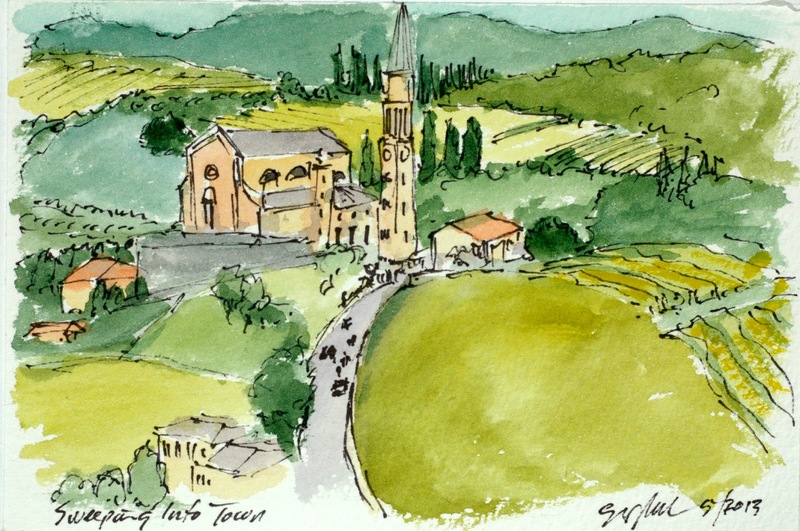 This is the break away riding into Nanto past the church and school nestled amongst the olive groves and vineyards. Yes, those little dots are the racers being escorted by the motos and the service vehicle. This is an original watercolor and ink postcard that could be yours by visiting my artist website. Just follow the direct link at the end of this post and get your little view of Italy. Today's stage was almost pancake flat, except for this nasty climb with the top just 16 kilometers from the finishing line. The peleton has just picked up Belkov from the early break with Fantini-Selle Italia storming up setting up Di Luca's attack. You have to admire his continued attempts at solo breaks to the line, he keeps coming up short, but he still tries on every steep climb near the finish. The striated fields in the back ground are another of the hundreds of acres of vineyards that the races passed by on Stage 17 on their way to Vincenza. This is an original watercolor and ink postcard that is available for purchase at my artist website. Just follow the direct link at the end of this post. 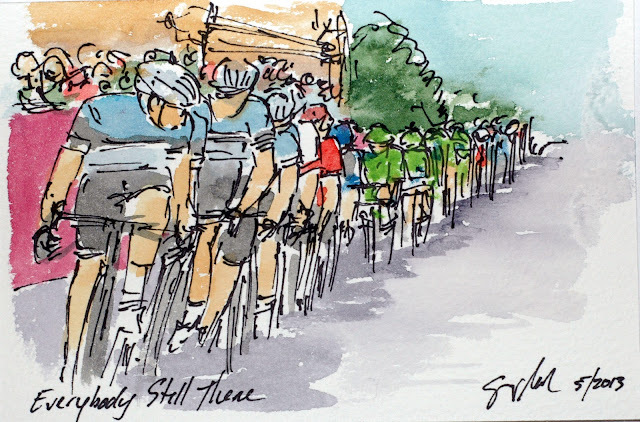 Giro Day Nineteen: What Are You Doing? The way I am creating this work is to watch the RAI TV feed and then pause the video when something catches my eye. 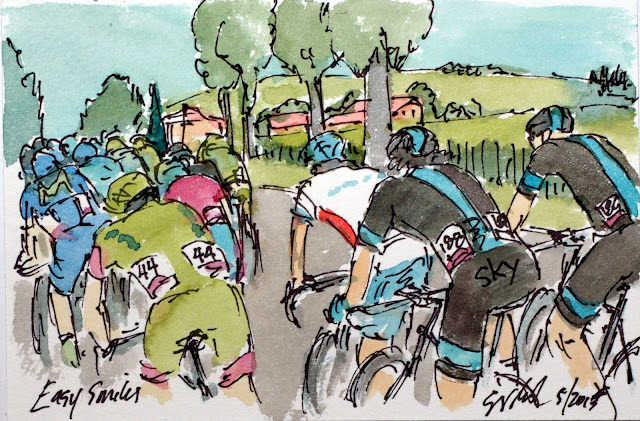 I don't speak Italian so I am not always sure of what the commentators are talking about (I am getting better at understanding as the Giro goes on). So when I paused this I couldn't figure out why Cavendish had come to the front of the peleton or why his fellow Omega Pharma Quickstep teammate had just swung off the front. 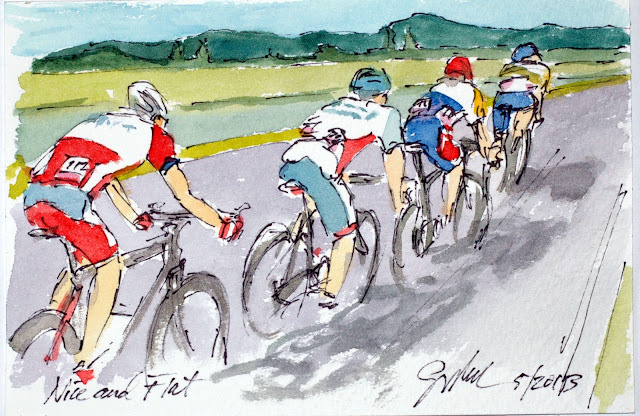 After finishing this piece and restarting the broadcast, I learned what was going on, one of the Intermediate Sprints was about 100 meters ahead of this image. This is an original watercolor and ink painting and can be yours by visiting my artist website. Just follow the direct link at the end of this post. Today was no exception to the pattern of early break aways getting five or six minutes on the peleton but the anticipation of another mass sprint made this effort as doomed as most. 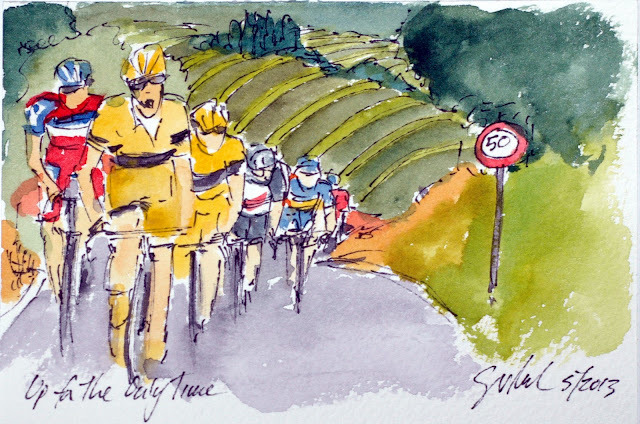 The stage was dominantly flat today as the cyclist spun through vineyards, factories and cities. This break was comprised of Belkov of Katusha, Rubiano of Androni, Dockx of Lotto and Durbridge the Australian National Champion and rider for Orica-Greenedge. This is an original watercolor and ink postcard and it can be yours by visiting my artist website. Just follow the direct link at the end of this post. The Feed Zone is a pre-designated area roughly half way through the race course where the teams can pass food to the riders. This is Maxim Belkov of Team Katusha grabbing his lunch on the fly, you can see a team helper for Euskatel just in front waiting for the main peleton and his riders to come through for lunch. 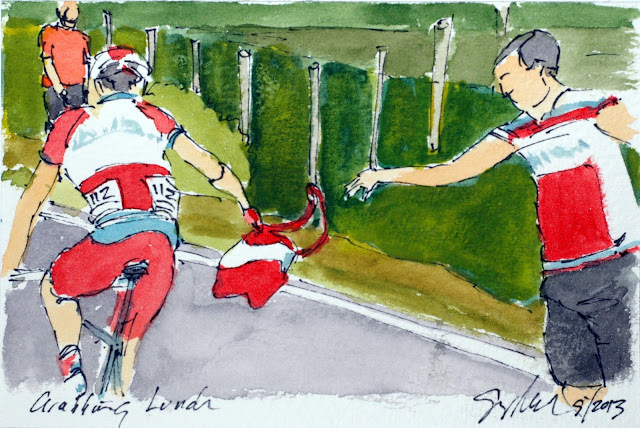 The riders will then sort through the bags, eating some of the contents, and stashing the rest in the pockets on the backs of their jerseys, finally tossing the bags to the fans that stand along the road hoping for a very special souvenir. This is an original watercolor and ink postcard that can be yours by bidding in a short 3 day auction on ebay. Just follow the direct link at the end of this post, but remember to act quickly, the auction begins as soon as this post is published. The scenery in Italy is stunning with ruins, castles, gardens, vineyards and sweeping vistas (and villas). And the earliest paved roads were built by the Romans, I was struck by the beauty of the break away passing under this ruined gate way before they crossed the river into the town of Valeggio Sul Mincio. Fortunately for the riders the road has been modernized since the days of the Roman Empire. I had the chance to try to cycle on the Appian Way outside of Rome, there was no way my little skinny tired road bike was going over those stones! This is an original watercolor and ink postcard and like all of the work in this series was created with cake watercolors, brushes and paper all from www.richesonart.com The works are also available for purchase at my artist website. Just follow the direct link at the end of this post. Stefano Pirazzi had been in the break away all day, at this point it had been 216 kilometers and he is desperately striving to stay ahead of the charging Maglia Rosa Group to get the last mountain points of the day, unfortunately a rider from Argos Shimano got the jump on him and got over the climb first. What impressed me was how he got swamped by the group but then still managed to jump out from the back of the group to be the second guy over the climb. He ensured that he will be wearing the Blue Jersey again tomorrow. This is an original watercolor and ink postcard and can be yours by visiting my artist website. Just follow the direct link at the end of this post. 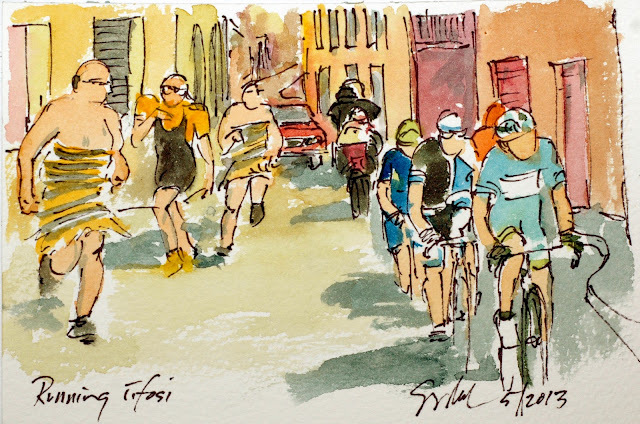 Tifosi are the exuberant cycling fans that run along side of the racers cheering sometimes in costumes, sometimes nearly naked, always joyful and excited to be so close to these international athletes. I am sure that alcohol frequently figures into the equation. This group seem to be conjuring up bumble bees, the guys were in black and yellow striped dresses (that would stay up) and their female companion wore a brilliant big shouldered yellow blouse with a tight black jump suit. All of this is being caught by the following TV Moto. This is an original watercolor and ink postcard that is available for purchase through my artist website. Just follow the direct link at the end of this post. Today was the day of attacks, counter attacks, break aways, and break aways form the break aways. When the peleton was upon the first break of the day the bulk of the break sat up, resigning to their fate of being put back into the fold, however, these three pressed on. Wilco Kelderman, Danny Pate, and Emanuele Sella were intend on winning the stage despite the rather long odds. 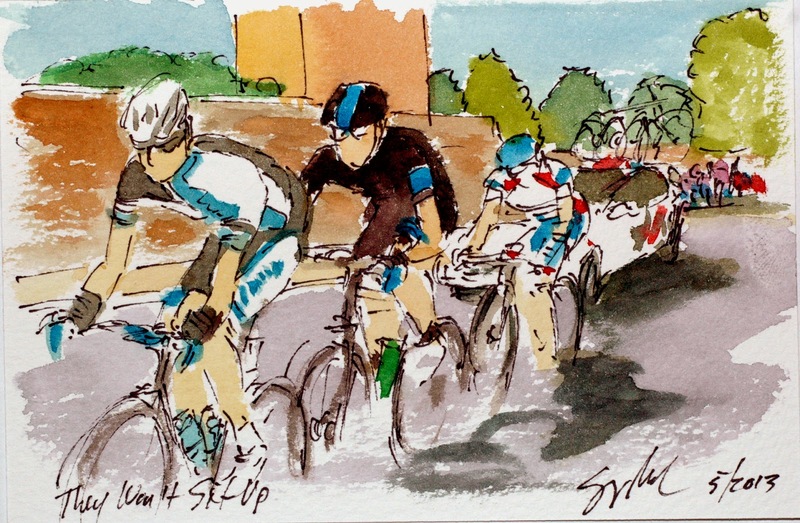 Their chances got better when the sprinters were dropped on the final climb of the day. This is an original watercolor and ink postcard and it can be yours by visiting my artist website. 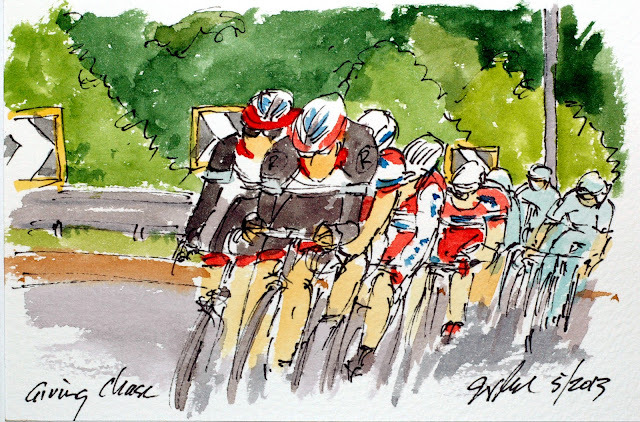 Just follow the direct link at the end of this post to get a piece of art from the 2013 Giro d'Italia. 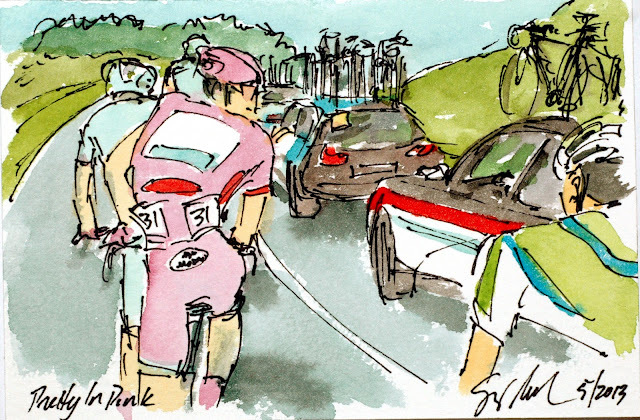 With the Maglia Rosa group and most of the peleton only two minutes behind the riders in the day's break away started attacking each other. The first two to take off were Pate of Team Sky and Southerland of Saxo Tinkoff. They got a few seconds, but then the next attack sucked them back on. This started the extensive barrage of attacks and counter attacks that characterized the rest of Stage 16. This is an original watercolor and ink postcard that can be yours by going to ebay and bidding on this painting in a short 3 day auction. Just follow the direct link at the end of this post, but you should act quickly, the auction starts as soon as this post is published. 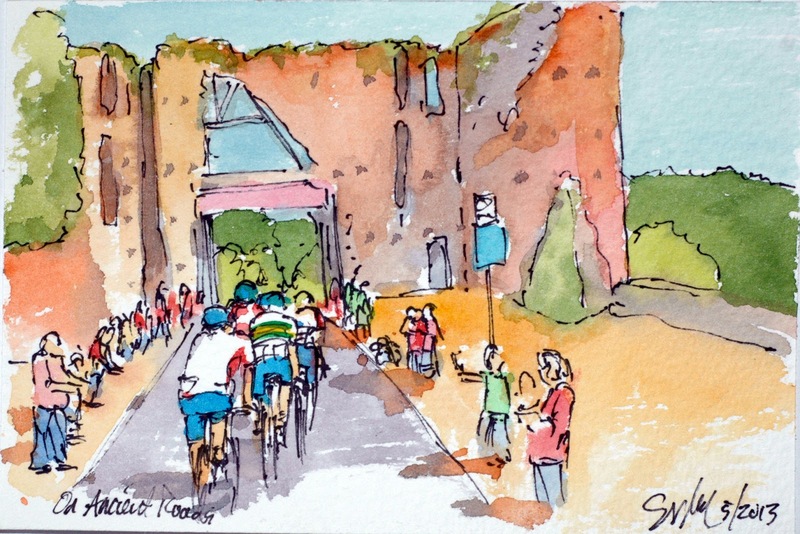 After Astana had been riding tempo for most of the day, Katusha and Radio Shack Leopold Trek can to the front and started chasing down the break away. In less than an hour the gap dropped from 5 1/2 minutes to just over 2 minutes. At that point they backed off the gas and other teams went after the break, it all came together with about 20 K to go. Actually the maglia rosa group caught what was left of the break, the stage had a very steep climb at the end of the stage that left a large part of the peleton broken into small groups all along the course. This is an original watercolor and ink postcard that is available for purchase in a short 3 day auction on ebay. 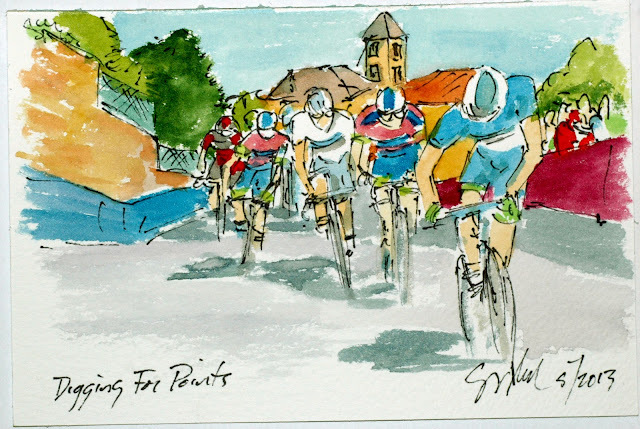 Just follow the direct link at the end of this post to bid on your piece of art from the Giro d'Italia. Apparently it was a day for talking and I don't think all of it was friendly either. 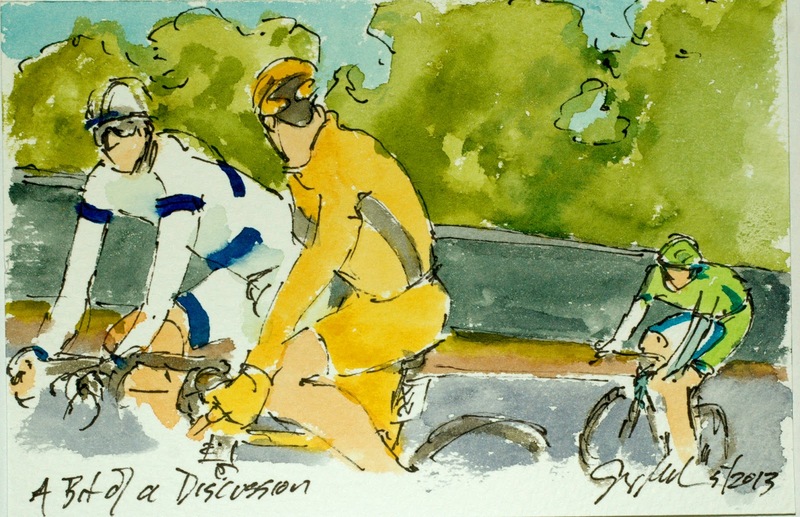 Danny Pate seems to be giving an earful to Meier who rides for Orica Greenedge. I am guessing this was done in English since Pate is from the USA and Meier is a Canadian. Navardouskas seems to be joining into the discussion as well, or maybe he is just saying, "Keep your eyes on the road." 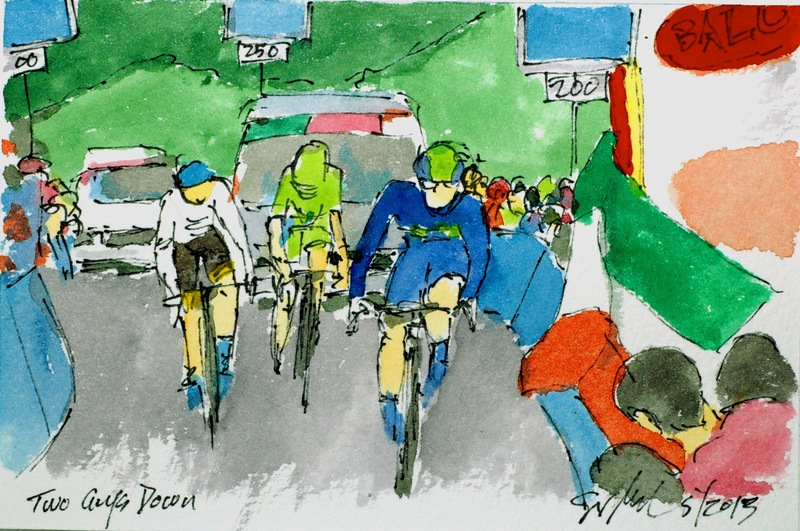 I often wonder what language is used in the peleton, does it follow the race's host country's language? This is an original watercolor and ink postcard that is available for purchase through my artist website. Just follow the direct link at the end of this post. Danielo DiLuca seemed to be a bit annoyed with some of his fellow break away riders, or maybe, being Italian, he was just gesturing emphatically while talking about what he did on the rest day. I doubt it. This is an original watercolor and ink postcard that can be yours by purchasing it directly from my artist website. Just follow the direct link at the end of this post. This is one of the many reasons that I love the Giro d'Italia, Felline knew that he had friends up the road, so he jumped out of the peleton looking like he was going on an attack to catch up to the break away. The next time the TV Moto catches him in the lens, he is hugging two friends along the side of the course. Once the peleton caught back up to him, he kissed the cheeks of his friends jumped back on the bike and got on with the race at hand. 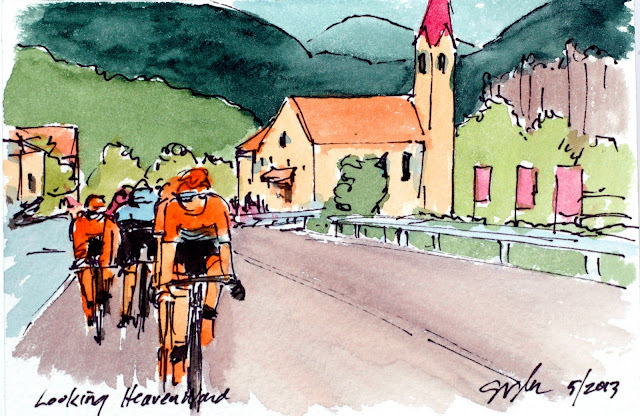 The first time I watched the Giro, it was the birthday of a rider in the peleton and they were going to ride through his home town. He rode ahead and joined a party on the side of the course. When the peleton arrived, he handed out pastries to the riders, as they got back to riding they took the trays of desserts with them, making sure everyone had a treat. 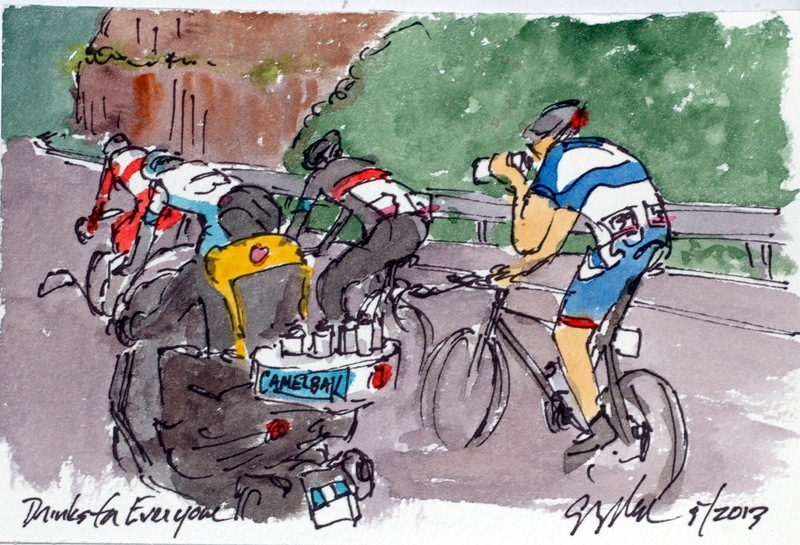 When they got to the end of town, they passed the trays to fans and got back to the hard task of the Giro. This is an original watercolor and ink postcard and like all of the works in this series, it was created with cake watercolors, brushes and paper from www.Richesonart.com Also, this work is available for purchase at my artist website, just follow the direct link at the end of this post. This is the day that the racers get to rest, usually only riding about 50 miles at a 18 -20 mile pace, what I would call a good hard ride for me. 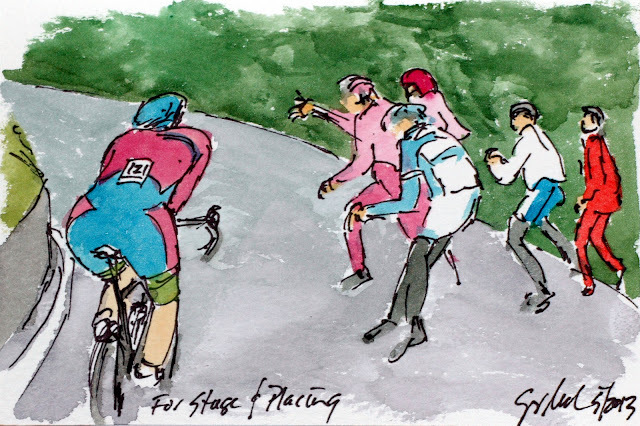 If they were to take the day off the bike, they would stiffen up so bad they may not be able to move when the peleton fires back up on Tuesday. It has been a rather spectacular two weeks of racing full of drama, determination and beauty. I am sure the final week will not disappoint. Vincenzo Nibali aptly defended the Maglia Rosa today although he did not gain any time like he did yesterday. He met the attacks by Scarponi and Evans and finished the day with the two not allowing anyone to threaten him in the overall GC. For the second day in a row the Giro finished on top of a mountain in a snow storm, I have always thought of Italy as a sunny warm country. But I guess that doesn't allow for the Alps on the northern border and they actually finished in France today. This is an original watercolor and ink postcard and it is available for purchase at my artist website. Just follow the direct link at the end of this post. The break away is just heading into the cloud bank full of snow on the top of the Galibier, the tifosi have been standing along the side of the road all day to see their heroes ride past. I did see one fool running beside the climbers wearing boots, a hat and his underwear. Once the riders had passed him by he stood there looking cold and confused, I sure hope he found his clothes again. 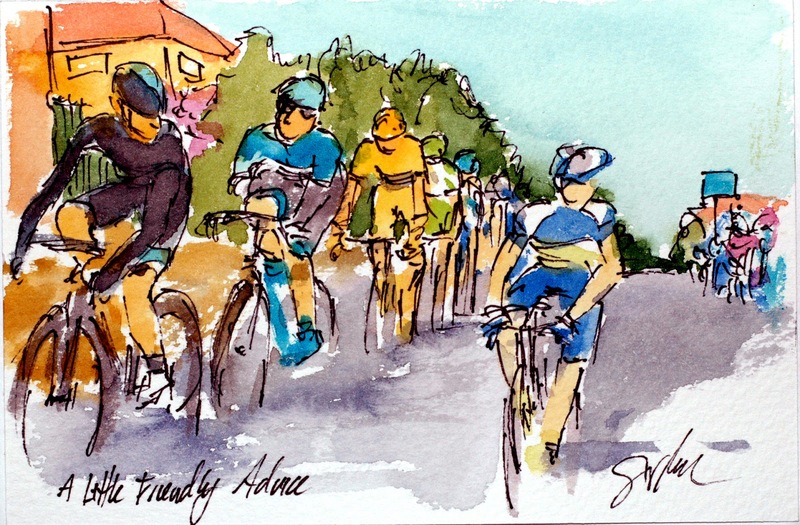 This is an original watercolor and ink postcard and it can be yours by going to my artist website, Just follow the direct link at the end of this post to buy some great cycling art. 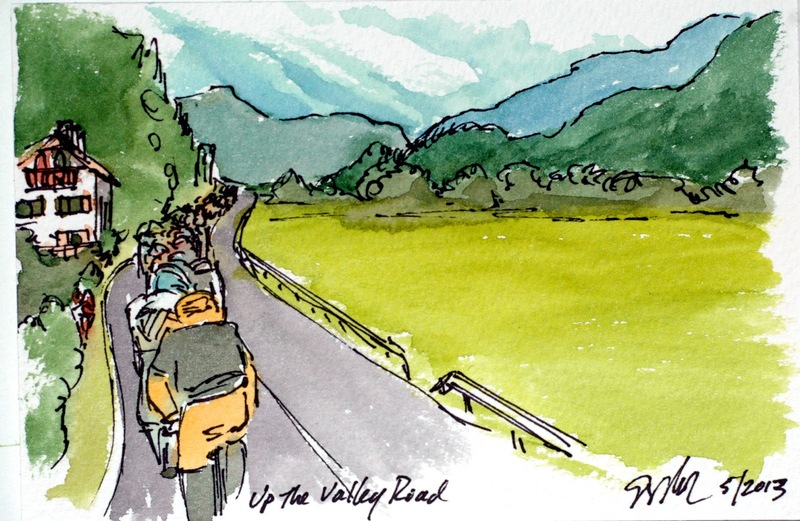 As the break away crossed the river and turned onto this small road they knew that it was all uphill until the finishing line. 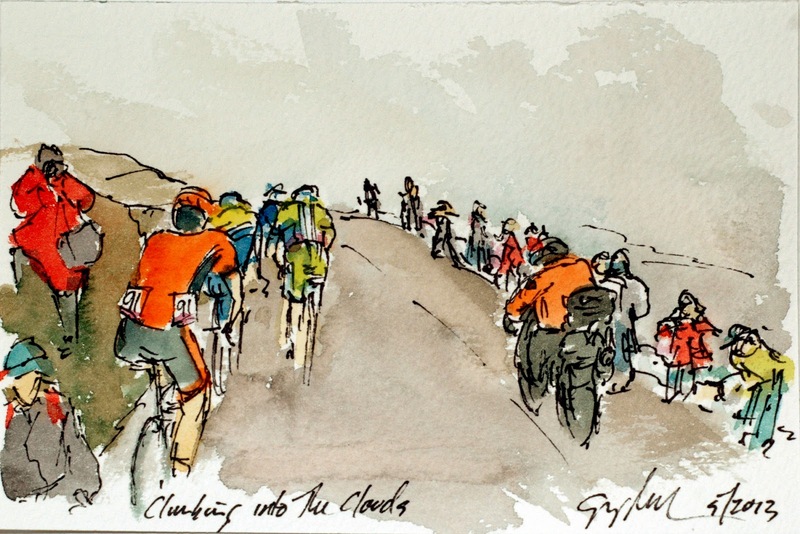 They have 20 kilometers of climbing with one short descent between the Telegraph and the fabled Galibier. Today, the Giro honored the memory of Marco Pantani, the pirate, who still holds the record for the fastest climb of the Galibier in a full road stage. The only person to have climbed it faster was Lance Armstrong, but that was in a individual time trial that started at the bottom of the mountain, not after 150 kilometers of racing before even starting the climb. This is an original watercolor and ink postcard and it is available for purchase through my artist website. Just follow the direct link at the end of this post. France wanted to get in on the beautiful scenery of the Italian race. This is the peleton heading across the valley as they prepare to climb the Col de Telegraph and the Col du Galibier with the added pleasure of doing it in the snow. This is an original watercolor and ink postcard that is available through a short 3 day auction on ebay. Just follow the direct link at the end of this post, but act quickly, the auction begins as soon as this post is published. With snow on the mountain passes and sunshine in the valleys, it was a tough day for the riders to get their clothing right. But, like good boy scouts, they were prepared with layers of clothing to shed as they and the day warmed up. 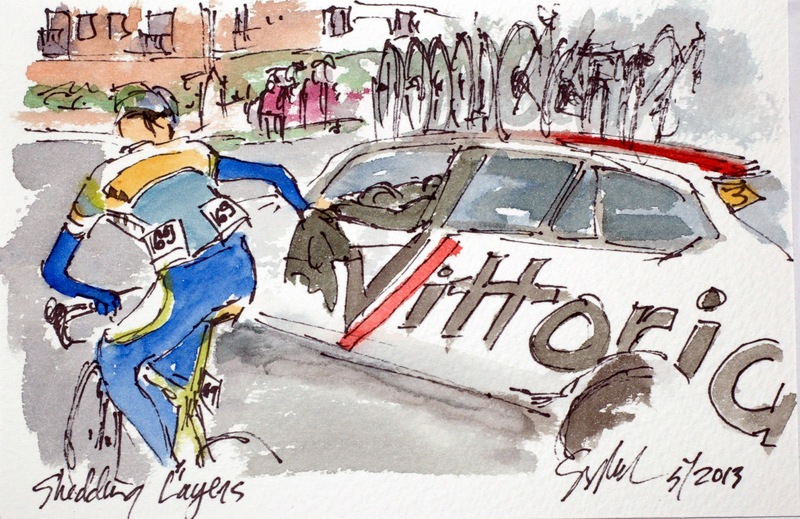 Weening knows that he doesn't have to worry about the cold wind of descents any more in the stage so he is passing his jacket to the neutral service vehicle. These vehicles are available to all of the riders, particularly when their team car can't get to them in a moment of need. The logo on the side, Vittoria, are Italian tire makers, my first racing bike had Vittoria sew-ups on it. This is an original watercolor and ink postcard and can be yours by visiting my artist website. Just follow the direct link at the end of the post. 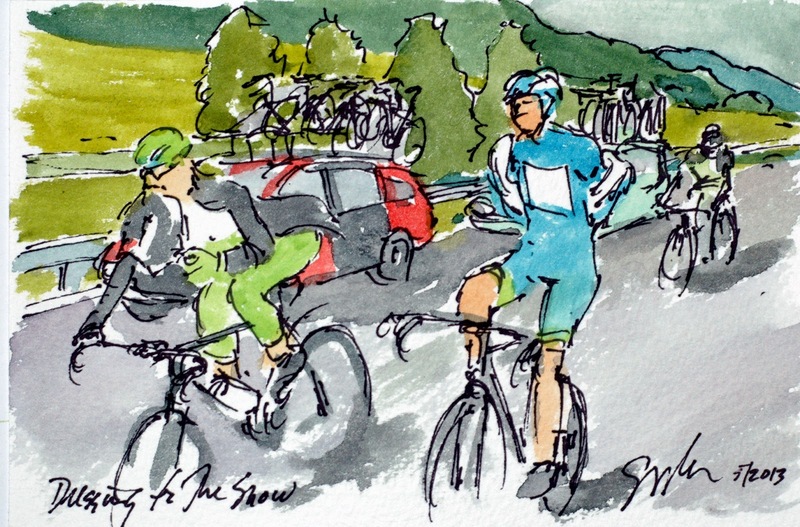 Giro Day Sixteen: This Is May? 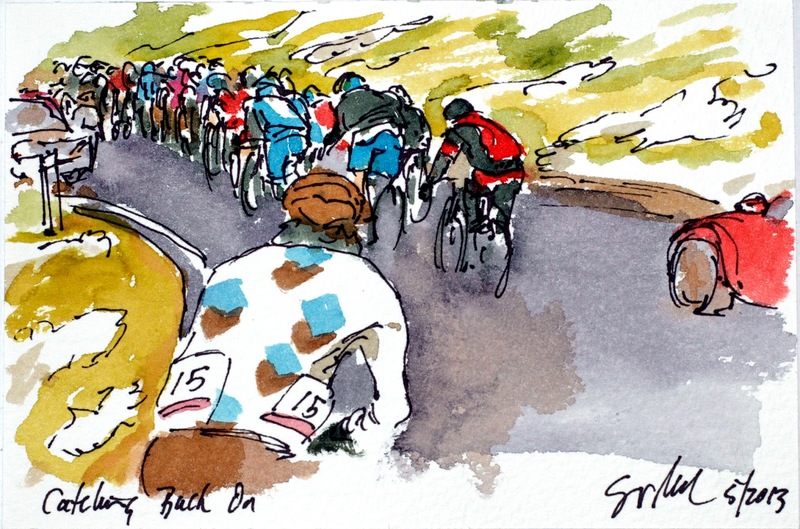 Giro Day Thirteen: Come On, Let's Go! Giro Day Nine: Why Did We Let Him Go?